The code which is used most inconsistently is “Lost Call”. This code should only be used for sessions where the patron does not respond during the session and no email address is provided. When Lost Call is used, the session will never appear in the Active question list of the patron library (or of the chatting librarian). Instead, the session will only appear in the Closed list. - Librarian picks up patron, and patron has no email address. Patron never responds during the session. Librarian should use Lost Call. - Librarian picks up patron, and patron has no email address. Patron and librarian chat, and librarian sends some web pages. Then patron disconnects. Librarian should code this as Answered. - Librarian picks up patron, and patron has left an email address. Patron never responds during the session. Librarian should use Follow Up by Patron Library. Please comment below if you have any questions or comments on Lost Call, or resolution codes in general. Scroll down the page to the section for LiveMeeting Recordings and click on the QuestionPoint Reports Webinar link. 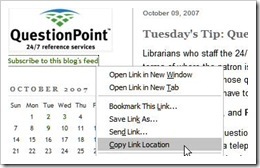 Tuesday's Tip: Resolve to Always Use a Resolution Code! Librarians must always select a resolution code at the end of each session. If no resolution code is chosen, then the session defaults to Answered -- not useful if the session should have been sent back to the local library for an email follow up. 1.1. Exclude transcripts of sessions with others' patrons from your question lists. With the new feature, institution administrators can select a setting in the Administration module that will exclude transcripts with other libraries' patrons from their Active Questions list. If this option is selected, only those transcripts with the library's own patrons will display.... In order for the exclusion to work reliably, however, chat librarians must select a resolution code at the end of the chat session; accepting the default resolution code will not work. Answered: No additional information is needed by patron. Follow Up by Patron Library: In most cases, use this code anytime Follow Up is needed. Follow Up by Me: Only use this code if you (the chatting librarian) have information at hand which will thoroughly answer the question. When you use this code, you are responsible for the follow up. Be sure and either send the follow up through QuestionPoint, or add a note that follow up has been done. Lost Call: If the patron never responds and does not have an email address. Do not use Lost Call if the patron left an email address; instead, use Follow Up by Patron Library. Right click on the “Subscribe to this blog’s feed” link. The link is right under the logo, in the left column. 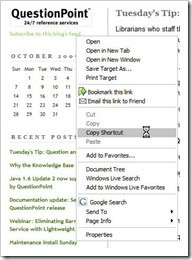 Open your RSS reader’s add-new-feed option and paste the link you just copied. Follow the reader’s instructions to complete the addition. Postings to the QuestionPoint blog will now automatically appear in your RSS reader, along with feeds from other blogs you’ve selected. Nylink invites you to participate in a QuestionPoint Users Meeting, being held immediately following our Annual Nylink Showcase on Tuesday, November 13. The Showcase is being held in a new, and very popular, location, this year--beautiful Saratoga Springs, New York. Come to Saratoga and join your colleagues to learn about the latest updates and enhancements to the QuestionPoint service, learn from peers about how they are using the service in their libraries, share your experiences with other users, and give your input and feedback about the future direction of QuestionPoint. Susan McGlamery, OCLC Global Product Manager for QuestionPoint, who will update the group on future directions and plans for QuestionPoint--and who is eager to hear your suggestions! Saratoga Springs is less than 30 minutes' drive north of Albany, and has regular Amtrak train service from New York City. The following tip was posted to the list serve by Bill Pardue from Arlington Heights Memorial Library. You might also recognize Bill from Slam the Boards. 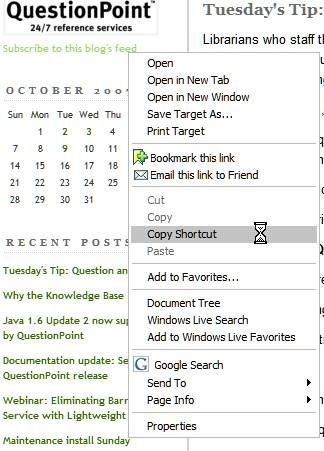 This tips for working with Internet Explorer 7's tabs is so good, we decided to post it to the blog in case you missed it on the list. Thanks for taking the time to write this up Bill!!! You go into Outlook to read some e-mail. You click on a link in the message. After looking around all over the place, you finally find it in a tab that isn't currently the active one...but you've missed the call. Worse, you just close all your windows (even the one asking if you want to close all your tabs!) and then you just have to log back in again. 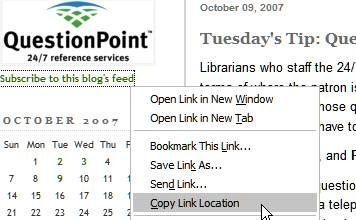 Tabbed browsing is cool, but the fact that links from other programs (like your e-mail software) usually get sent to a new tab in the most recently-used window has caused problems for some librarians who are new to the tabbed environment in IE7. Plus, if the Chat window isn't the "top" tab, its name won't display in the task bar, so if you have lots of windows open, you may have to dig around for Chat. However, there's a simple fix! In IE7, go to Tools/Internet Options. This setting will keep your e-mail software, etc. from opening a new tab over your chat window. It does, of course, open more windows on your desktop, so if that's more of an issue for you, then simply ignore this. If your library uses the QuestionPoint software, then please join us at the California Library Association for a QuestionPoint User Group meeting. This will be your opportunity to join your QuestionPoint colleagues to share your experiences with QuestionPoint and the 24/7 Reference Cooperative, and hear about plans for the ongoing enhancement of QuestionPoint. Quality Tip: Peruse the Policy Page! Student: Will calculators TI-89 be given out today? Librarian: Hi! I am a librarian with the <name of service>. Your library and my library are part of a nationwide group that provide backup for each other's service. I'm reading over your question and will be with you in just a moment. Librarian: Hello <student’s name>. I'm not sure that I understand your question. Is this a question about one of your classes? Student: no. <Library Name> lends calculators for students for the semester, so i would like to find out if I will be able to borrow it today. Librarian: You should contact your library directly for information on this. Do you need the phone number? Student: no. i have it. thanks. have a good day. If after August 29 there are still some calculators left, they will be distributed on Thursday, August 30, at 10:30 am. Students are advised to get in line very early on days that the calculators are being distributed. Patron: How Do I re-check out my movies online? Patron: I have movies that are do back today but I still would like to watch them. How do I renew them online without having to go down to the library? Librarian: Hello <patron's name>. Let me check your library's policy page to answer your question. Librarian: According to the policy page: Visit any time, 24-hours a day through <name of catalog>. Click on Patron Account from the homepage and enter your barcode number and password to access your information. Librarian: Items may be renewed up to 2 times. Patron: ok great thank you so much!!! Librarian: May I help you with anything else? Librarian: Goodbye. Thanks for visiting <name of service>. Feel free to contact us again, if you have further questions. So, when you are online with a patron from another library, make it a habit to check the policy page. There is a wealth of information there that can help you during online sessions. And if you are an administrator, be sure your policy page contains the most current and complete information so that Cooperative librarians can provide better service to your users. Do you have questions or comments about policy pages? Comment to the blog, or send an email to Susan McGlamery, [email protected]. The QuestionPoint team will host a one-hour Live Meeting session entitled “QuestionPoint Reports Webinar” on 22 October from 11:30 a.m. to 12:30 p.m., Eastern Daylight Time (3:30 p.m. GMT). Microsoft Live Meeting will be used for the visual portion of the webinar and a dial-in toll-free conference call for the audio portion. Question the patron, and Point to a resource! "Answering" a chat question does not mean knowing the answer to a question before picking up the call. When you "answer" a telephone, you pick it up and engage in a dialogue--the same should occur in a chat session, with an emphasis on the dialogue. A librarian's job is not so much to answer questions, but to ASK questions. Even "answering" a question involves a question: "Is this information useful to you?" 2. Read what the patron wrote. 3. Scroll through the "Patron Info" tab. 4. Click "Policies" link to open the Policy Page. 5. Ask the patron a question. 6. Send a resource (or paste specific information from Policy Page). 7. Ask the patron if the information is useful. 8. Repeat steps 5-7 until the patron is satisfied, or choose a follow up option. 9. Send a goodbye message. 10. Close session using the appropriate resolution code. Thanks to Wren Spangler, our Quality Team leader, for this great tip!